This Easter Gingerbread House post is courtesy of our contributor Dawn of Revel and Glitter…You may think that gingerbread house decorating is just for Christmas, but if you are like me and are always looking for an excuse to buy Easter candy for more than just eating, today’s post is just for you! 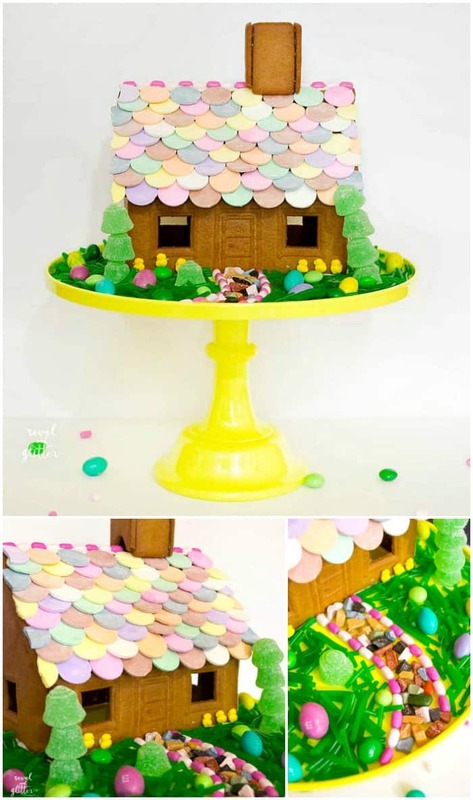 With so many fun candies out there, creating an Easter gingerbread house is a fun way to create the perfect centerpiece for your holiday table! I have a bad sweet tooth so I love heading down our local drug store’s candy aisle; they have so many classic candy choices, I love finding new ways to play with them. The seasonal candy aisle has lots of great choices for inspiration as well, from candy eggs to chocolate critters. 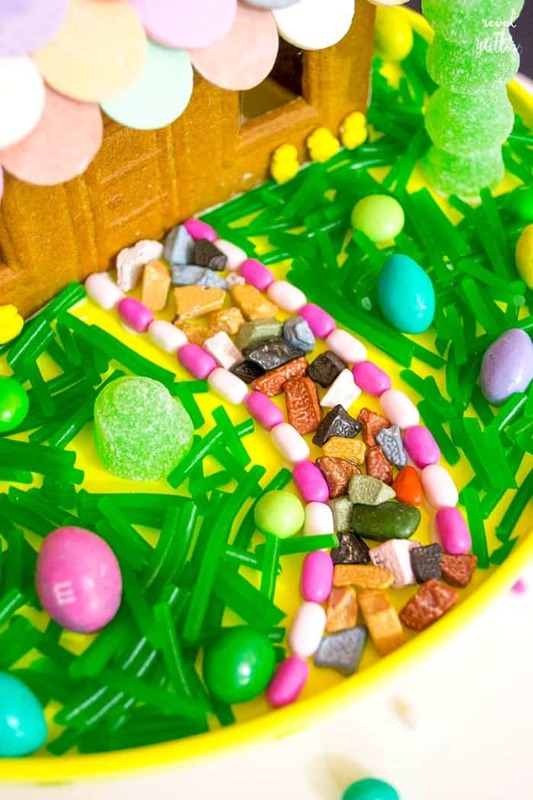 Our Easter gingerbread house is a fun mix of classic and seasonal sweets. 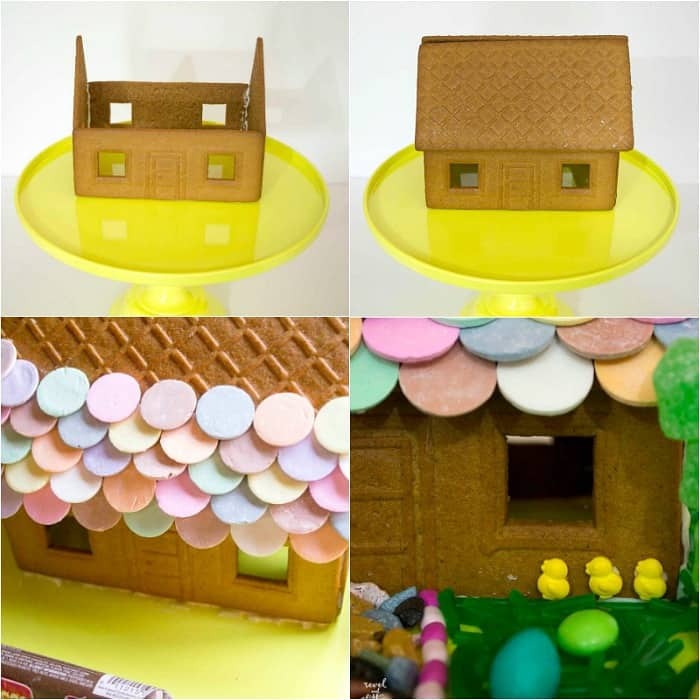 Assemble your gingerbread house and build on your platter or cake stand. 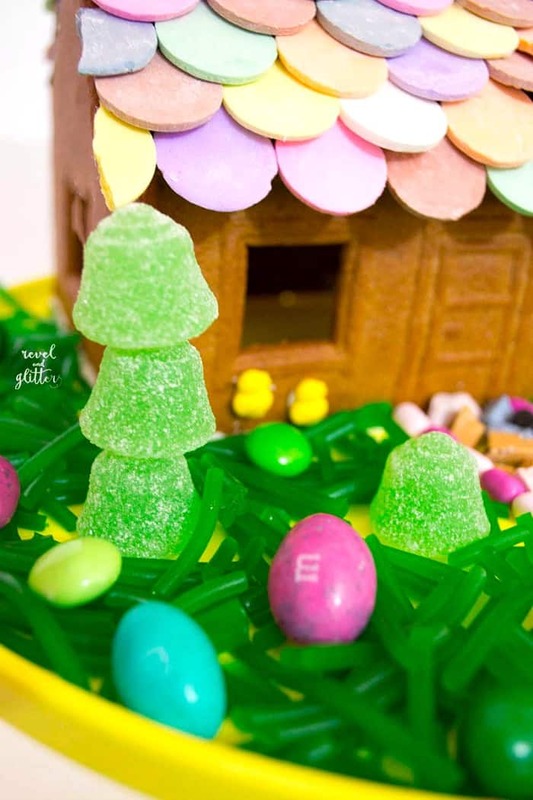 While your house sets, make a few ‘trees’ by stacking gumdrops on toothpicks and create ‘grass’ by cutting up the licorice grass into small pieces. Slice a few Mini Snickers bars to create “bricks” for a walkway. Set these aside. 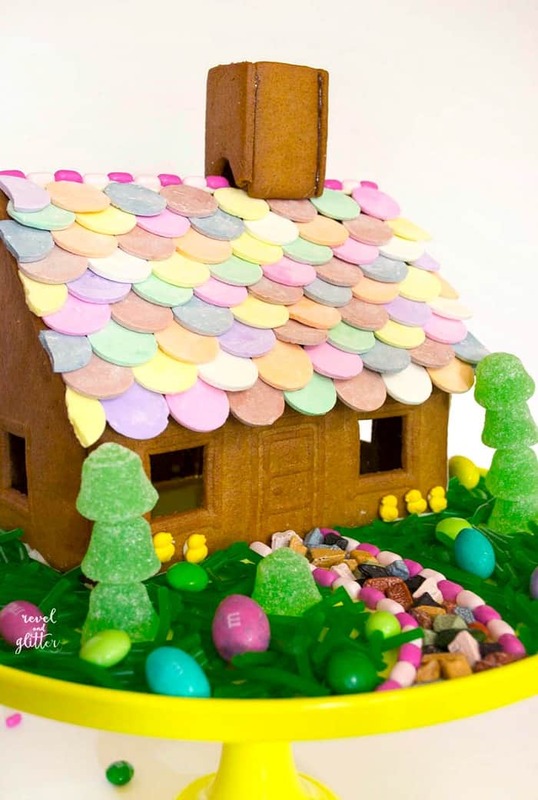 Decorate the roof of your house with the Necco wafers using icing to attach. Create the look by layering the wafers by slightly overlapping each row over the previous. I did a random pattern but feel free to be creative and cluster colors together or make each layer the same color. Helpful tip – to trim the wafers so they are flush with the roof’s sides, use a mini wire cutter. Trim small sections of the wafer to the desired size. A knife or scissors apply too much pressure and break the wafer. 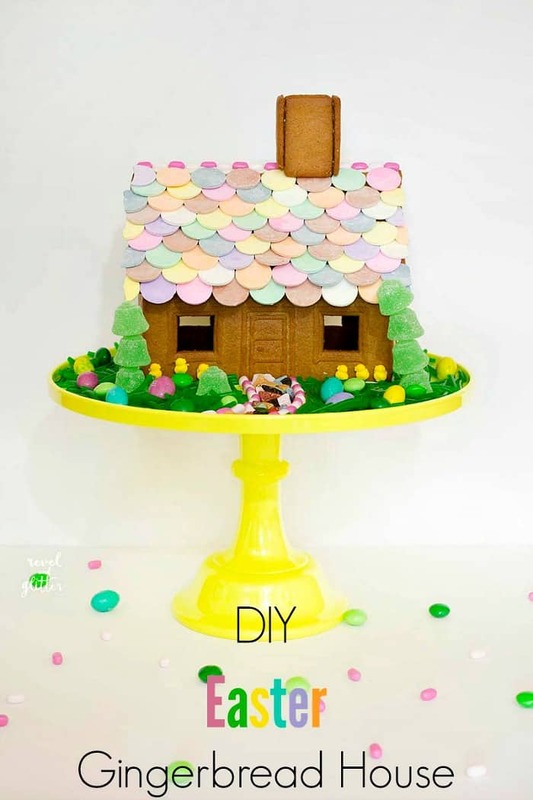 Add a row of icing to the top of the roof’s peak and attach Tic Tacs. With a small drop of icing, attach the sprinkle chicks to the front. 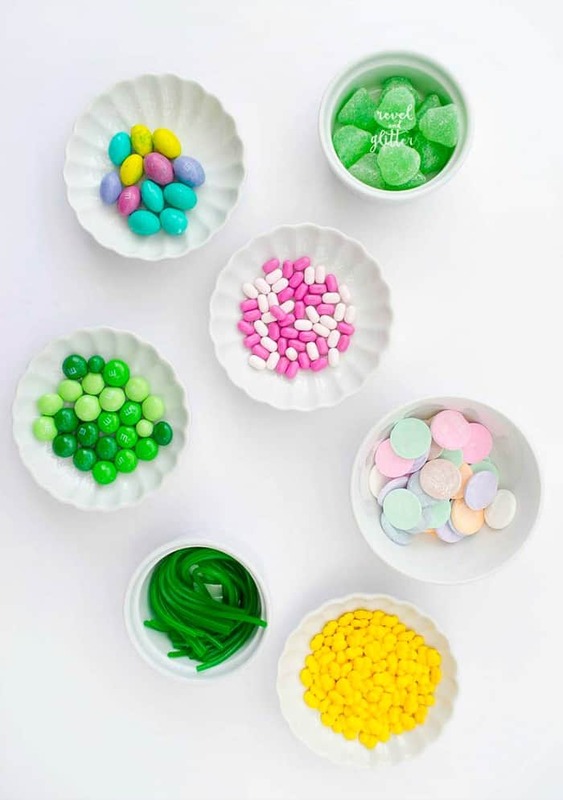 To create the walkway, add two lines of frosting to your platter or cake stand, attach Tic Tacs, then fill with candy pebbles. With a dollop of icing, attach the gumdrop trees to the platter or cake stand and fill with the pieces of licorice grass. Finish off the look scattering the M&Ms across the grass. Voila! A perfect and tasty look for your holiday table (if it makes it) will be the star of your Easter brunch, lunch or dinner! I hope you have been inspired, decorating gingerbread houses is great family fun all year round. 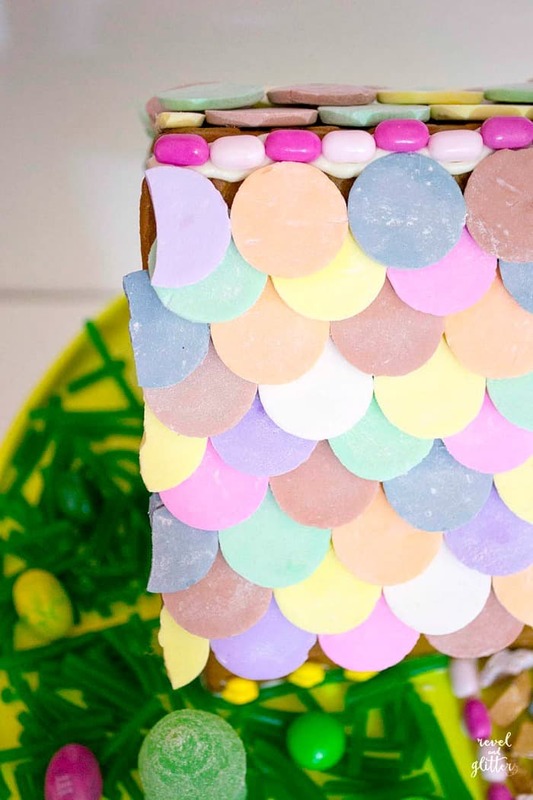 Need more Easter inspiration? 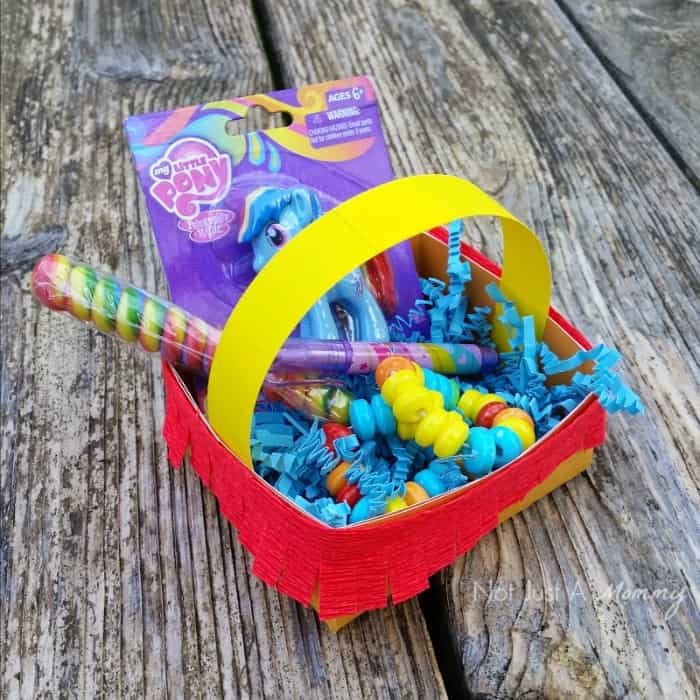 I share lots of great tables, recipes and crafts on my blog, under my ‘Easter’ tag like these fun Easter paper baskets! They are so easy to make and customize for kids and adults and perfect for place settings. We’d like to send a big THANK YOU to Dawn of Revel & Glitter for sharing this creative idea with us. Over on Dawn’s blog you’ll find plenty of party ideas for all of life’s celebrations. I hope you’re ready to plan a party because she’s sure to leave you inspired! Be sure to follow her on Facebook, Pinterest and Twitter for even more creative ideas. This is such a fun idea! I really love how colorful this turned out and the fact that it can be used as a centered piece for your Easter table.